This outfit is actually a couple weeks old from a professional development day we had. I took advantage and dressed down for the day with my camo pants. Initially I wasn't sure about camo, so I was happy to find this pair on thredUP for a steal to try them out ($10 off your first purchase here). Now I love how comfortable this pair is and how versatile they can be! I've styled them with coral, ivory, burgundy, and polka dots. Now I am trying them with a pop of pink and loving the contrast of the masculine camo and feminine pink. I always feel confident when mixing two seemingly contrasting styles. It makes for such a fun outfit! 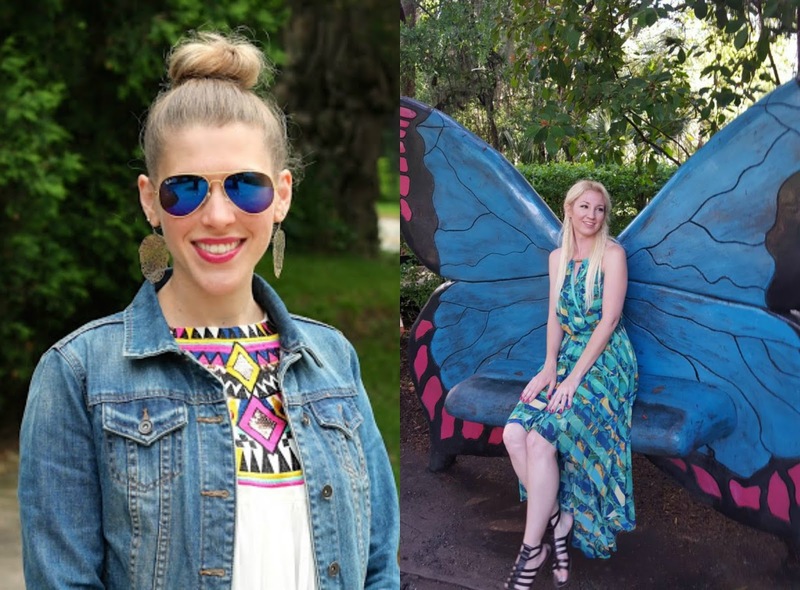 Today Stephanie from Go Fashion Dealsis co-hosting. I've been following Stephanie for a while and she is such a sweetheart with great style! She's also one of those people who literally look good in everything. Yes, I am slightly jealous. Go visit her blog and say hello! Nice way to dress down, the pop of pink def brightens up the whole look. Thanks for hosting the link up! Pink and olive is such a pretty combo! Love this cute and casual look on you! love the color combo, these flats are so cute. Very cute outfit and such a lovely color combination! Thanks for hosting the link up! I hope to see you Friday at my On the Edge of the Week Link Up! I LOVE Camo pants and I love that you added pink with them...you look fantastic!! Love the subtle camo with the pretty pink camo, super cute look!! This is such a cool an polished look! I love the pants. That bag is a pretty color too! Every time you wear those camo pants, I just love them. The pattern is so muted and doesn't look too overpowering. Its nice you have some flexibility where you work in terms of what you can wear! That tee looks nice and comfy! I love a good white tee! Lovely casual outfit, the pink bag is gorgeous! Very comfy and stylish look! love the bag! The bag is the perfect pop of color with the outfit! Great look! I like how subtle the camo is. If I could find a pair like that I would totally try them! Great look! and that touch of pink from your handbag - looks brilliant! Thank you for hosting. Great casual outfit. Love the pop of color with your bag and your sandals. The pop of pink is genius!!! Come see how I welcomed Summer in a boho-inspired look at the blog - Happy Tuesday! I love the camo with the pop of pink! It is the perfect casual outfit! I love how subtle the camo is on those pants. Cute with your denim! I love the yin/yang idea in dressing also---I think it adds fun to our outfits. The nice thing about your camo pants is they aren't "in your face" camo. In fact, I thought they were just brown at first glance! I love a casual sleeve roll on a denim jacket. Such a great, laid back look. I love the camo pants, and I like that the camo is fairly subtle. I've never been sure about camo print but I would wear these! I love it with the pop of pink too. This is my kind of look! I love your pants! Beautiful Laura! The pop of color with the bag was the perfect choice! So pretty!! 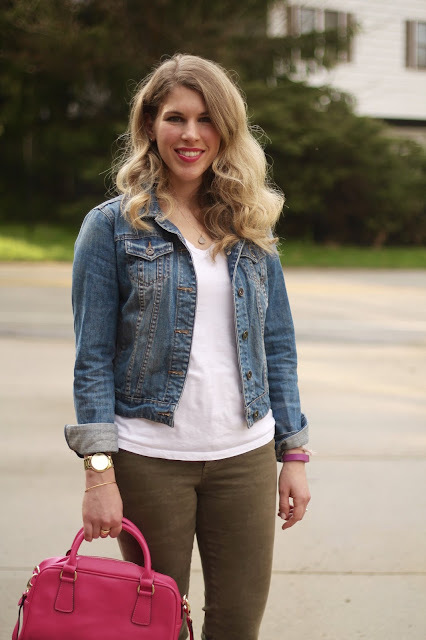 Pink and camo/olive green is one of my favorite color combinations...that's actually what I'm wearing in today's post! Great casual look and I love the color mix! I need to give camo and pink a try myself. 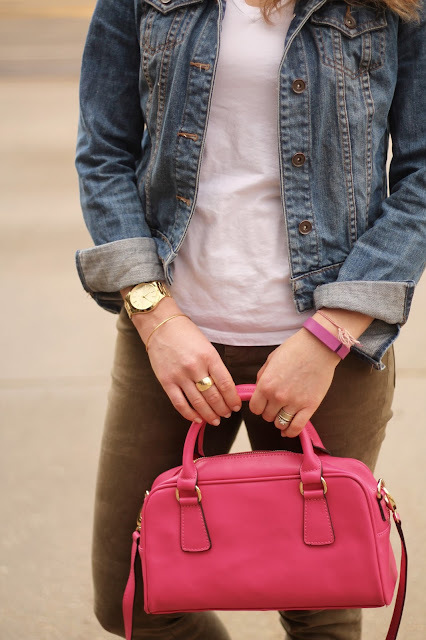 Digging the classic jean jacket + that bright pink purse! This is adorable. Hmmm I have all these pieces too, I know what I'm wearing tomorrow! I love these camo pants on you, and they look great with the denim jacket. Also loving the pink bag! I love the pop of pink in this look. Your olive camo pants look great on you, I love the pink bag with it. Last year I paired blush with olive, like the pink, it is an unexpected combo but looks great. I love a good jean jacket. Cute! Denim and camo look good together! I also like your pink bag! Love me some camo and pink. Great bright pink bag, too!! Yay for staff development days when you can dress comfy (but keep it cute). Love the pop of pink, Gorgeous! Thanks for hosting! I love that the cammo print on the pants is subtle, I think it makes them so much more versatile! Love your casual chic look! Like you mentioned, those contrast colors are really pretty together! Thank you so much for your kind words on my blog. Don’t forget to come back every Monday, Wednesday and Friday to link up with me again! Such a cute look! I love the layers with the denim and the camo works so well with so much! Lovely combo, and I have the same bag too. This is such a cute and comfortable looking outfit! I have wanted to try a pair of pants this color (just haven't yet). I've used thredup before...but I tend to forget about them. Smart of you to get your pair from there to try them out!! I love the pink bag paired with them, and that denim jacket is so cute! I was on the fence about camo as well and got a grey pair which for me was easier to wear. I love mine and would love to add a green/khaki color ones. Love how you styled yours! It's definitely a great cas outfit. You can never go wrong with neutral colours. Love this! and esp that pop of pink with the purse! lovely outfit for casual days! This is such a great casual outfit, Laura! I love that you added pink for a feminine touch! I want to add some skinny camo pants to my closet. A simple but chic Spring look.